From my home in Safford, I watched an especially nasty looking thunderstorm hover over Mt. Graham during the early afternoon of July 4. "If the storm moves on, I'm going hiking up there" I thought. It did, and I did. Within an hour, I was at Shannon Campground, with hopes of making the top of Heliograph Peak before another thunderstorm blew in. With a copy of the Mt. Graham topo map and rain gear in my pack, I started up the Arcadia Trail. 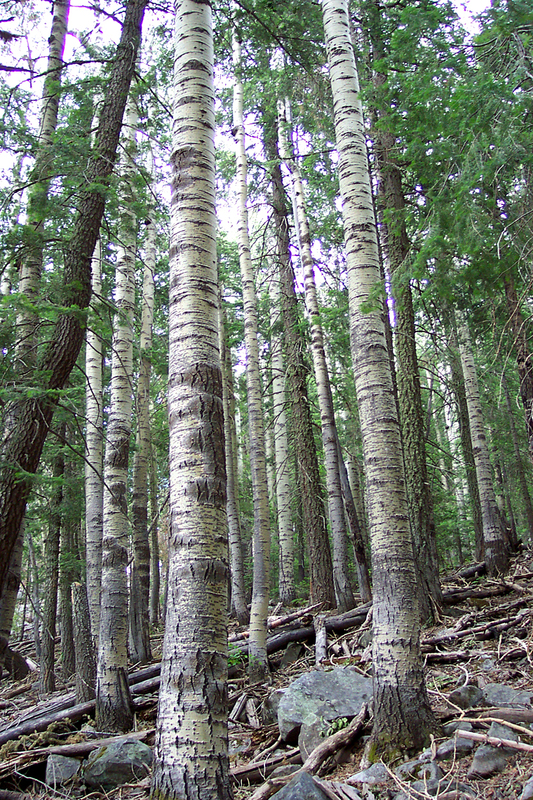 For the first mile, I hiked through beautiful stands of tall firs and aspens. Upon reaching the saddle, the trail to the top of Heliograph Peak split off to the right. The trail crossed over a short rocky ridge, and soon arrived on the northern slope of Heliograph Peak. 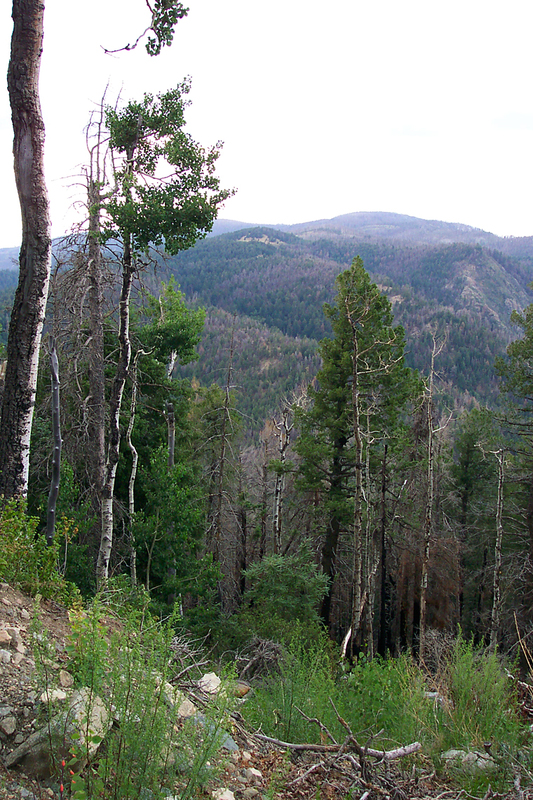 The 2004 Gibson Fire had completely cooked this area, but thousands of new aspens were already chest high. 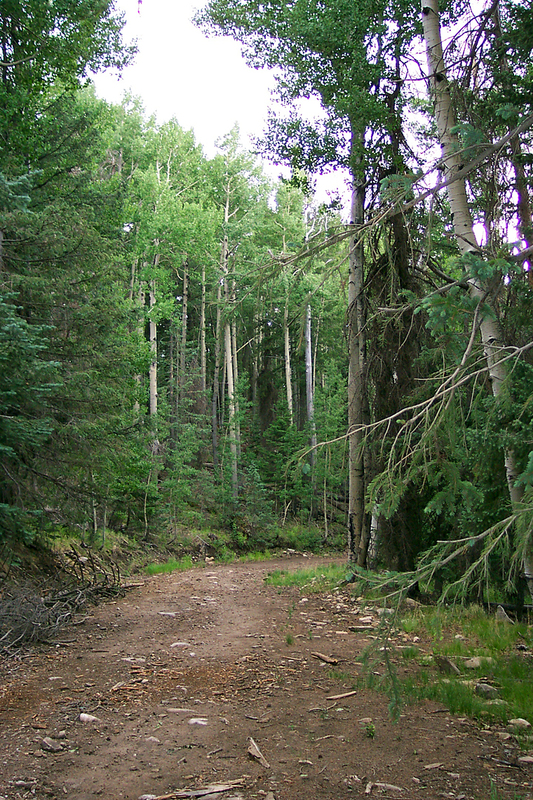 The rest of the way up was slow going, due to erosion following the fire and thickets of aspen covering what remained of the trail. Old log erosion bars and new cairns showed the way. Once the abandoned fire tower was in view, the trail left the burn area, and passed by a couple of small blue spruce trees. 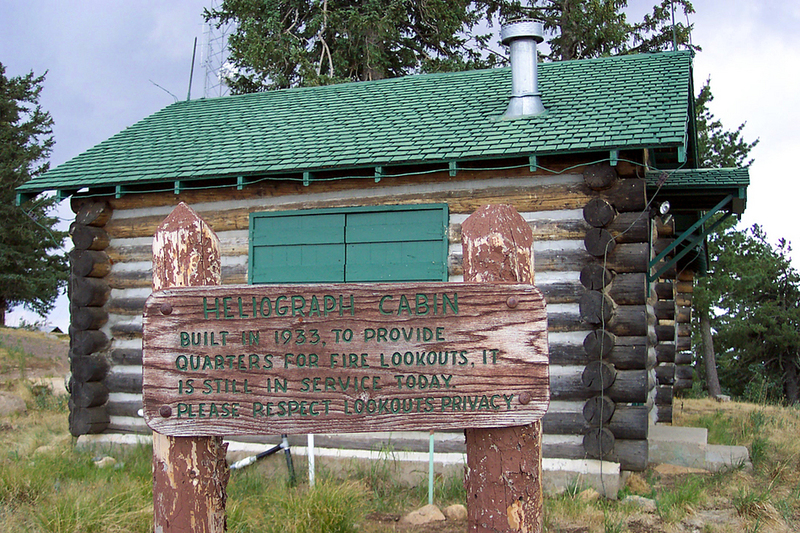 Nervously eyeing an new thunderstorm overhead, I shot some pictures of the top of the peak and the historic Heliograph Cabin. Somewhere up here is where the U.S. Army had a heliograph (a sun reflecting signal mirror used to communicate over long distances) during the Apache wars of the late 1800's. A loud crack of thunder soon let me know that it was time to go. I decided to return via the old fire road, as the forest it passed through appeared to have been spared from the Gibson Fire. I made good time descending the road, passing through pristine forest and watching a thunderstorm wreak havoc on Mt. Graham itself. I shot pictures constantly on the way down, while hiking past some of the biggest trees I've ever seen. "This is the most beautiful hike I've been on in a long time", I thought. After a couple miles, I passed by the permanently locked gate (the road has been off limits to vehicles for years due to habitat needs for the Mount Graham Red Squirrel), and was back at the turnoff for Shannon Campground. I walked the short distance back to the start of the Arcadia Trail, through the empty campground, and sat down in the bed of my truck. A busy woodpecker kept me company as I wrote this trail description down under a stormy sky at Shannon Campground. I love this mountain! From Safford, head south on SR 191. Turn west onto state SR 366 (Swift Trail) and follow 20.9mi. Turn right and follow 0.2mi to Shannon Campground.